July 26, 2018, 11:00 p.m.
With John Major discussing Brexit on the Andrew Marr show last weekend, many people took to social media saying that they would prefer to have a Prime Minister they were genuinely pleased to see kicked out of office 20 years ago leading the country instead of Theresa May. 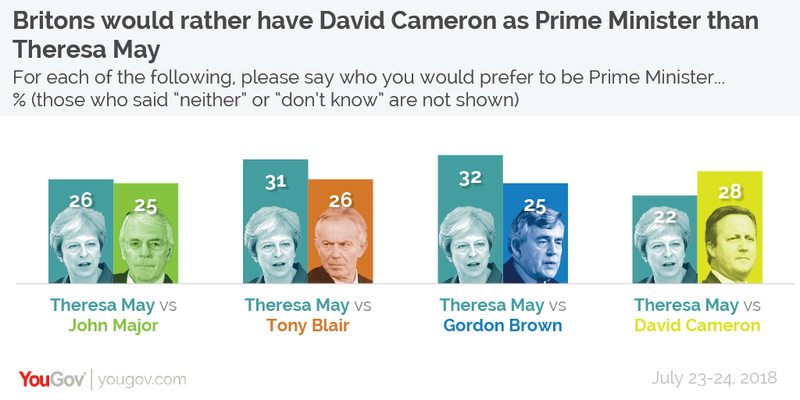 This inspired us at YouGov to ask the nation – which, if any, of the four still-living former Prime Ministers – John Major, Tony Blair, Gordon Brown and David Cameron – would they prefer to be in charge instead of Theresa May? The results reveal that Britons would prefer David Cameron to be in charge than Theresa May, with 28% plumping for the former and 22% the latter in a head to head. Nevertheless, 41% of Brits answered “neither” and a further 9% “don’t know”. Cameron’s strongest supporters are 18-24 year olds, who favour the former PM over the current one by almost three to one (38% vs 13%, and with only 27% saying “neither”). 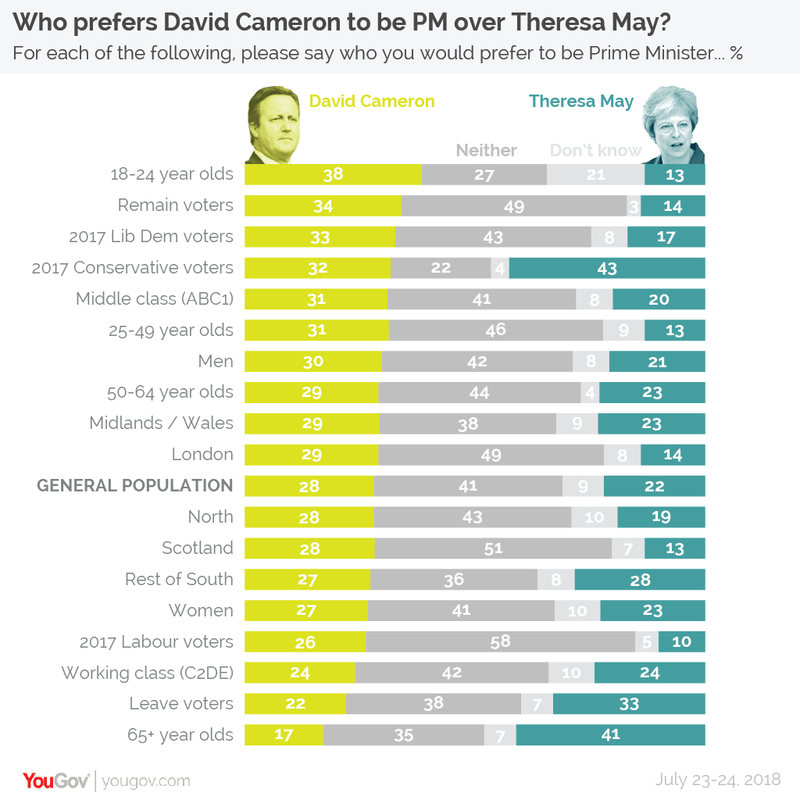 In fact the only age group that prefers May over Cameron are those aged 65 and older, by a margin of 41% to 17%. Given these generational divides, it is no surprise that Remain voters come down on Cameron’s side (34% to 14% for May), while Leave voters prefer May (33%, vs 22% for Cameron). Among voters who backed the Tories in 2017, the current PM is preferred over her predecessor by 43% to 32%, while Lib Dem and Labour voters choose David Cameron over Theresa May by 33% to 17% and 26% to 10% respectively. 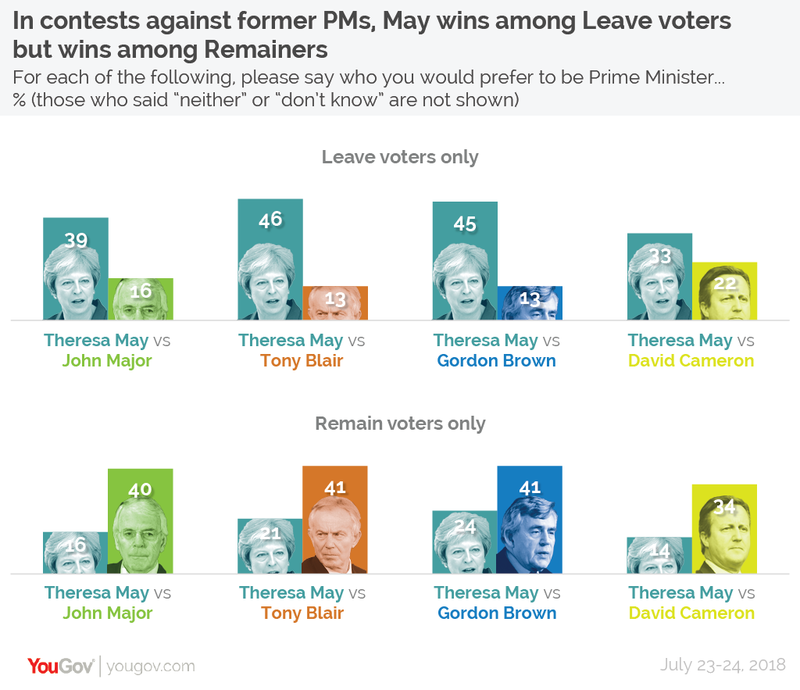 None of the other three former Prime Ministers proved more popular than Mrs May: she beats Gordon Brown by 32% to 25% and Tony Blair by 31% to 26%, while the contest with John Major is closely tied at 26% to 25% in May’s favour. The two former Labour PMs are unable to beat the current Conservative one due to the intransigence of the Labour electorate. While 65-67% of 2017 Conservative voters back their own party’s candidate in these two head to heads, this figure is only 44-46% among 2017 Labour voters – 39-43% said they wanted neither candidate (only 22-24% of Conservatives said the same). Had Labour voters backed the former Labour PMs at the same rate that Conservative voters back Theresa May then Blair would edge ahead of May with 33% of the vote and Brown would tie at 32%. As with the contest against Cameron, Remain voters tend to break in favour of the former PMs and Leave voters in favour of May. Likewise, the older voters are the more likely they are to prefer May to the other three competitors. The reverse is also true, except in the case of John Major who seems to have lost a higher number of 18-24 year old voters to the “don’t know” column (35%) than Blair and Brown (25-26%).